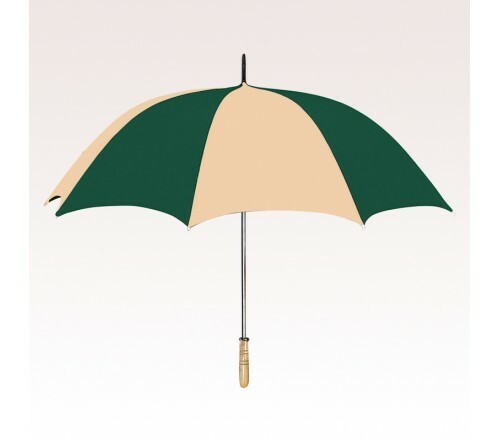 Personalized khaki & forest green 60” arc golf umbrellas largely express that “big green theme”. 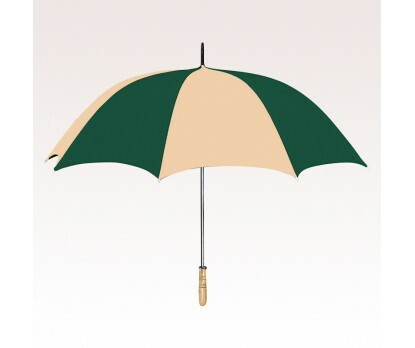 This umbrella can be easily distinguished by its bright big khaki & forest green nylon canopy, wooden handle, and strong metalized shaft. Most of the colorful promotional umbrellas are always used during summers, whereas this umbrella can be used throughout the year because it is made wind resistive and possess that green appeal. Imprint area - 10" W x 6" H. All green thinking businesses, and individuals can utilize this umbrella for expressing their brand themes and thoughts. Available Colors : Royal ­­Blue, Khaki, Red, Green, Pewter/Black, Royal Blue/Black, White/Royal Blue, White/Teal, White/Red, White/Green, White/Black, Khaki/Navy, Khaki/Maroon, Khaki/Black, Khaki/Forest Green,Red/Black and Red/White/Royal Blue. Product & Design Quality - Love how these umbrellas turned out ! Product & Design Quality - We are very pleased with our umbrellas and the custom logo looks amazing! Thank you! Customer Service & Shipping - We received our umbrellas in a very timely manner. Customer Service & Shipping - Customer service was amazing! I explained what I needed, the rep was friendly and helpful and helped me order. FedEx was less than helpful, so if you can avoid shipping via them, I would. They didn't attempt to deliver even though it was a business (and open), said WE requested a later delivery (we didn't) so our order came in late and missed our Open House, but that isn't US Umbrellas fault! Just ship via another service. Product & Design Quality - Great quality, people at our firm are already using the black & white umbrellas with our logo imprinted! Our CEO loved them! Customer Service & Shipping - Your staff, especially Tamyra Hollis, was great at follow-up and letting me know every step of the way what they needed, and made changes to the artwork as necessary. On top of all that, they were shipped earlier than anticipated, even our out-of-state office got theirs early! Product & Design Quality - Great looking umbrellas. Logo looked awesome. Customer Service & Shipping - Rapid, on time and well managed. Thank you. Product & Design Quality - Product and design quality was great. Customer Service & Shipping - Very good customer service. Customer Service & Shipping - Quick shipping and great customer service. 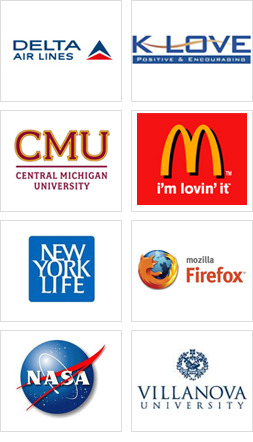 Product & Design Quality - High quality product that sells itself. Members of our Lodge are thrilled with the umbrellas and love the logo for our 100th Anniversary. Customer Service & Shipping - Very helpful and the time between ordering and delivery was wonderful. Customer Service & Shipping - The customer service I had worked with was pleasant over the phone. But she was lacking in quality service. I had to contact her many times on a time sensitive order after requesting a response. I had to let her know of mistakes she had in the invoice that she rationalized with me for typing too fast. Product & Design Quality - The umbrellas that weren't damaged are excellent. Customer Service & Shipping - Still waiting for resolution on a damaged item. Have sent in description and pictures of damage as requested but received no response so far. Need replacement item by 1/22/18. Product & Design Quality - We are impressed with the design and the quality of the product. Customer Service & Shipping - Service and shipping were excellent. Product & Design Quality - Great job! Customer Service & Shipping - Customer Service worked very well with me to get a completed project delivered to me on time. Product & Design Quality - First - the name is Materese not what you have written. Second, we were pleased with the quality of the product as well as your being able to match the design we needed. Customer Service & Shipping - Your customer service was excellent in addressing our needs. It was courteous and efficient. Well done!. Shipping was on time and quick. Overall, this was a great experience and I would recommend your business to anyone. Thank you. Product & Design Quality - Everything looked exactly like the proof we were given. They turned out awesome and all of our employees loved them. Customer Service & Shipping - Very quick service! The questions that we had we answered and everyone was very friendly and helpful. Product & Design Quality - Excellent product at a good price. Very pleased with product. 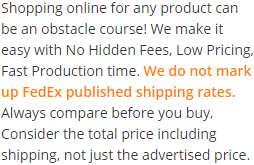 Customer Service & Shipping - Excellent customer support and quick responses. Fast delivery. Product & Design Quality - Great! Customer Service & Shipping - Wonderful! Product & Design Quality - Excellent. Customer Service & Shipping - Very good. Product & Design Quality - Great job of putting our logo on the umbrella. It was quick and easy to make changes in the colors. We were really pleased with the result. 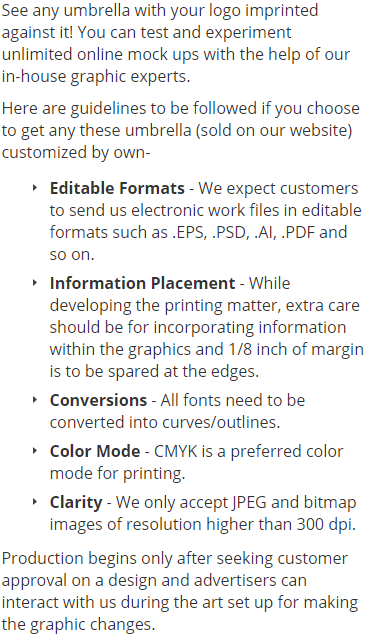 Customer Service & Shipping - A little more communication on the shipping would be appreciated. We got a confirmation that the artwork was approved, and a confirmation on the payment, but never received anything stating that our order had been shipped, so we weren't sure when to expect our order. Product & Design Quality - The product quality is wonderful! The color is great and size unbeatable. Product & Design Quality - The title says black and white umbrellas but that is not correct. I need to know our delivery date and time. Customer Service & Shipping - I need to know our delivery date and time.